“They achieve their goal of guiding the reader to consider the whole child through engagement, inquiry, personalization, and emotional connections. Teachers will receive tools to be detectives looking for the unique gifts and potentials in all children and learn how to best nourish them to fruition.” —Judy Willis, M.D., M.Ed. ﻿Lori Desautels is an Assistant Professor in the School of Education at Marian University in Indianapolis teaching undergraduate and graduate students. Lori is currently applying educational neuroscience research, and social and emotional learning, two days a week directly in the 5th grade and 7th grade classrooms. Michael McKnight is a curriculum specialist for the Department of Education in New Jersey. He is a former special education teacher and administrator of adolescents who have been challenged with emotional disabilities. He is currently an adjunct professor at Stockton University teaching special education. ﻿Learning is the most natural thing human beings do. Yet, it seems the “harder” we work in schools helping our students to acquire the learning they need, the academic performances stay stagnant or lessen. Schools are not machines. Schools are a network of human beings who feel, think, behave, and function within a human system that is alive and never static. Schools are living systems. This living system of sentient beings are neuro-biologically wired to feel first; to think, to love, to connect, and to experience deep joy as well as deep disappointment and pain. 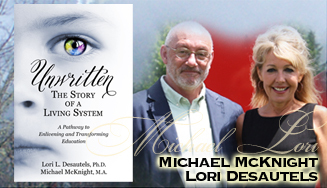 This system is wired to thrive, even through difficult times— Lori and Michael believe that we can begin to create wholeness and connection within our schools, and help them to thrive, mindfully and by design.